During the entire month of February, Sticky Fingers Bakery (on Park Road, east of 14th) will be selling our new “I’m Clucky to Have You” Valentine’s cards, which you can personalize with a note to your sweetheart then add it to our heart-shaped window display inside the restaurant. 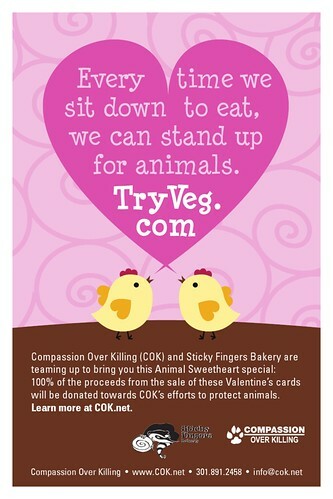 The back of card includes a special note of compassion for passersby outside the restaurant to read—and 100% of the proceeds from the sale of these cards will benefit COK’s work on behalf of farmed animals. Each card is just $1. Continues after the jump. WASHINGTON – Now that the snow is melting, let’s heat things up New Orleans-style and celebrate Mardi Gras at Eatonville Restaurant! (2121 14th St. NW) From live Jazz music, to a stunning aerial performance above the main dinning room, we’ve created a Mardi Gras celebration that invites you to taste, see, and hear the extravagance and sensuality that embodies Mardi Gras. · Sunday Evening – A Valentine’s Day Mardi Gras Affair featuring New Orleans-inspired pre-fixe menu and featuring a live performance by an aerialist above the dinning area. Starting at 7 p.m. Introducing our new art gallery – “Pueblo Viejo”! Barreiro Salon now features a wide array of art work by well renowned Latin American artists that complement the elegance of the salon and create an atmosphere of beauty and comfort for our customers. Art work will be available for viewing and purchase at this event! You work hard so treat yourself to a spa treatment or new hairstyle! Barreiro Salon offers a variety of services including facials, massages, pedicures/manicures, haircut & style. Please call 202-328-4480 to make an appointment. Coupons for $20 off on massages and facials will be offered at this special event, so don’t miss it!! pistachio trufs Please join us for a chocolate tasting featuring chocolate from The Cacao Tree. Artisanal chocolatier Sandra Escobar will be offering her delectably beautiful chocolate selections for sampling. This same selection was presented last year to President Barack Obama. Gift assortments for Valentine’s Day will also be available for sale.